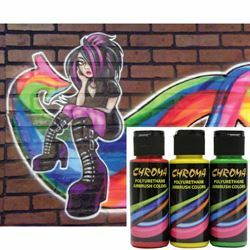 Updated and improved using feedback from leading wildlife and fine artists, Chroma Polyurethane Airbrush Colors represent the finest in co-polymer technology. They are waterbased, non-toxic, pre-mixed, and ready to use. Keeping the original polyurethane binder, the highly concentrated colors provide a matte finish. Colors range from tones for wildlife through bright, contemporary colors, and are completely intermixable. When fully cured, they form a tough, water-resistant layer of pure color. These paints are perfect for all applications on metal, textile, paper, illustration board, wood resin, and much more.